When it comes to running, the last thing on my mind was an ultramarathon—I had an idea how far a marathon is by looking at the route taken by the Milo Marathon which is “just” about 42K, but an ultra, especially 100K, was unimaginable. In fact the first time I’ve heard of the term “ultramarathon” was when I heard the stories of the Pinoy Ultra Runners—I was like a child being told a fairy tale that I didn’t know for the first time—my eyes were probably gleaming while a dream was being shaped—a dream I didn’t realize I can accomplish before my first running anniversary. How was it possible for a mere mortal to go from zero to an ultramarathon in less than a year? Endurance. Everyone has their own endurance level. Unless you’ve won the genetic lottery a normal person should train himself to be able to endure very long distances. Of course improving your endurance doesn’t come overnight—it is built one day at a time, like races are completed one step at a time. The best way to achieve this endurance believe it or not is really simple—long runs. Endurance training doesn’t really focus much on the speed but more on the time you give to your run. Long Slow Distance (LSD) runs are best because for starters it is slow so anyone can do it at their own pace, but the key here is the long part—normally it is long distance but of course the distance you cover is also relative to how long the time you give for each run. Like I’ve mentioned earlier the focus here is not speed so naturally the longer (time-wise) you run regardless of your speed, the longer the distance you cover. I was very lucky when I started doing my long runs because I started during the one of the coolest months of the year, February (2009). The later sunrises and earlier sunsets plus the much lower temperature mean more opportunity to run (although less sunlight). I started doing my long runs (LSDs) not really to train for an ultra since I had no plans to do one then, but instead to improve my endurance to be able to run longer. By the end of 2008 my longest run was at 16K (10mi) and I was aiming for my first half-marathon which is anything but short. LSDs, how seemingly less effort you put into it, when done regularly would benefit everyone regardless of the distance you want to train for. Best of all you don’t have to do it several times a week—an LSD a week is enough so better dedicate good amount of time for each. If you train from December to February you may start as late as 7AM but in any case you should avoid running beyond 9AM outdoors. During other months it’s better have the least exposure time with the sun so you must start as early as possible, and if the absence of sunlight isn’t an issue for you running at night also works. Like I mentioned earlier the LSDs I had were not originally intended for ultramarathon training. These routes were made because I really find it boring to run at the same place many times, add a sense of adventure to my runs, and seek new places. Admittedly I wouldn’t have been encouraged to do these without my Garmin Forerunner 405 to track my time and distance (among others). Tracking the distance you covered and time is important in doing LSDs because you need to track your progress and you may use many sites on the web to measure the distances of the routes you want to cover. I encourage you to measure the distance of your route first so that you may approximate how long you’d take to finish it (and adjust your course accordingly). Also known as my “MRT Tour” this one started from the Northern tip of the MRT, running along EDSA, until reaching the SM Mall of Asia compound and includes the bayside path to complete the target distance of at least 21K. 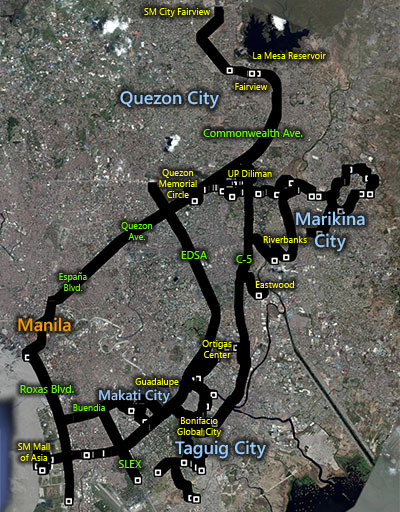 More or less a simulation of typical 21K route within Global City that includes a pass through McKinley Hill and Heritage and finishing at Bonifacio High Street (BHS). After about a month of being away from the Philippines I returned to doing LSDs and that time closer to home: Commonwealth Market to Quezon Memorial Circle (QMC) returning back and ending in Regalado Ave.—the northernmost route I’ve done to date. Who would’ve known that I covered half of the route of the Quezon City International Marathon with this route? This also served as my last run before completing my first 21K later on, the Condura Run. With the excitement I got from LSDs it’s almost automatic for me to have one whenever I am not running any races. With the thought of doing my first ultra looming I also had to gradually step up my LSDs. April 12, 2009: Commonwealth Ave. to MoA via Quezon Ave., España Blvd., and Roxas Blvd. One of the most picturesque routes and easily one of my favorites, it passes through the historic city of Manila. Don’t take this route if you don’t have your camera and is not willing to stop to enjoy the sights. To date my longest non-race run—so long I had my marathon and ultramarathon distance debut with this run! With about 20 days to go before my first ultramarathon race, TNF100, it’s a must that I do a serious LSD to prepare my body for the grueling 100K. I highly recommend this route to those planning to do their first ultramarathon. I actually had a repeat of this route last August 02, 2009 (but was a few meters shorter at 56.00K) with more friends adding to the community of ultra-runners. I encourage ultra-runners-to-be to take this route because of its challenge (generally uphill) and distance which is even longer than some ultramarathon races. For the past year I did a lot of LSDs covering nice distances and interesting routes both within and outside Metro Manila. Recently though I’ve yet done a 20K+ route but despite that I still benefit from the endurance I gained with these LSDs (click here to see the complete list of my runs) and was even able to complete my first marathon, still within my first year of running. As you may notice I wasn’t as consistent with my LSDs as I’ve wanted but it still works! What’s important is the honest dedication and effort to practice, and in the end you reap what you sow. You may not be planning for an ultramarathon but this “secret” is proven to help anyone willing to improve themselves. As you can see training need not be imposing—all you need are some sense of adventure, an open mind, and a willing body. Better yet grab along some crazy buddies with you to share the fun! Just don’t forget to bring along your common sense on your exploit! See you on the road, and have a safe run!